The bar before it rebranded. TWO RESIDENTS OF the Carrickmines halting site were refused entry into a pub in Dundrum on Sunday afternoon, a day after 10 of their relatives perished in an enormous fire in the south Dublin suburb. 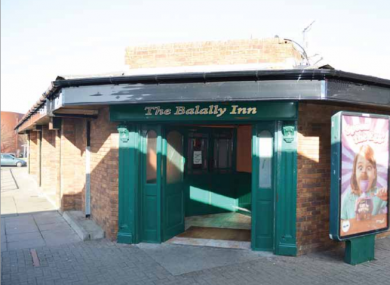 The two men arrived at Ollie’s Bar, formerly the Balally Inn, for Sunday lunch but were refused entry, TheJournal.ie has learned. It is understood that they were told they were ‘not regulars’ at the venue which is just a few kilometres from the Carrickmines site. A garda with special responsibility for equality was called to assist the two men. Local councillor Chris Curran also made representations on their behalf to the owner of the establishment. Speaking about the incident, he said the pub owners were “foolish” in their decision. “I think it was a mistake,” he added. He said the Traveller men, who lost 10 of their family members in the devastating fire on Saturday morning, were “extremely patient” throughout the episode. They left Ollie’s Bar and went elsewhere for lunch. The 10 people – from two interlinked families – have been named as Thomas and Sylvia Connors, their children Jim, Christy and Mary (who was just six-months-old), William Lynch, his partner Tara Gilbert, their children Jodie and Kelsey, and William’s brother Jimmy. Tara was also pregnant at the time of the fire. The victims, and as many as 15 others, had been living at the temporary halting site on the Glenamuck Road South for the past six years. There has been no comment forthcoming from Ollie’s Bar following a number of requests. A number of books of condolences have been opened around Dublin to allow people to express their sympathies to the families and the wider Traveller community. The Society of St Vincent de Paul (SVP) has also opened a special bank account at AIB in Dundrum to accept public donations for the families affected by the fire. More details here. Email “Relatives of Carrickmines fire victims turned away from Dublin bar”. Feedback on “Relatives of Carrickmines fire victims turned away from Dublin bar”.